Fifty years ago, the standard longitudinal bridge paving practice was cumbersome, had many limitations and resulted in marginal ride quality. In 1961, Terex® Bid-Well ushered in a new era in bridge paving with a revolutionary machine that paved decks laterally to deliver more flexibility for bridge design and improve surface smoothness. At that time, Omaha, Neb.-based construction company Kiewit Corporation saw the value of this new style of paving. 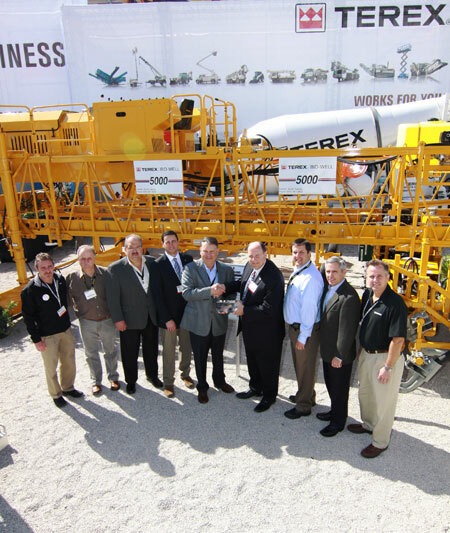 Fifty years later, Kiewit Corporation continues to use Terex Bid-Well pavers to pave the bridges it builds. On hand from Kiewit to accept the crystal were: Keith Sasich, vice president of Equipment; John Swanson, equipment sales representative; Keith Greene, equipment purchasing and sales agent; and Dan Kwallek, purchasing agent, purchasing and sales equipment department. Accompanying DeFeo from Terex were: Steve Filipov, president, developing markets and strategic accounts; Rob Drew, site director for Terex Bid-Well; Alan Henderson, account director–strategic account group; and Joe Krider, vice president of strategic accounts and government affairs. The first Terex Bid-Well paver design in 1961 included an oscillating strike-off pan riding along a 48-in (1,219 mm) deep truss frame. It paved bridge deck widths reaching 60-ft and offered improved speed, efficiency and quality over the then-conventional longitudinal paving method. Today, featuring the patented Rota-Vibe® system for superior finish, Terex Bid-Well bridge pavers are capable of paving widths beyond 200 ft (61 m). The original 48-in (1,219-mm) truss frame has evolved to the current 4800 paver, and 36- and 24-in (914- and 610-mm) frame depths have been added to the line with the 3600 and 2400 paver models respectively to give contractors more equipment choices for paving bridge decks. The line also includes the Terex Bid-Well 5000 and 6500 highway/airport pavers, the 7000 HD canal paver, concrete placers and placer/spreaders and work bridges.